ACS is pleased to distribute “The Voting Rights Amendment Act of 2014: A Constitutional Response to Shelby County," an Issue Brief by William Yeomans, Fellow in Law and Government, American University Washington College of Law; Nicholas Stephanopoulos, Assistant Professor of Law, The University of Chicago Law School; Gabriel J. Chin, Professor of Law, University of California-Davis School of Law; Samuel Bagenstos, Professor of Law, The University of Michigan Law School; and Gilda R. Daniels, Associate Professor, University of Baltimore School of Law. In the Issue Brief, the five authors analyze the major elements of the Voting Rights Amendment Act of 2014 (“VRAA”), bipartisan legislation that seeks to remedy some of the damage inflicted by last summer’s Supreme Court decision in Shelby County v. Holder. 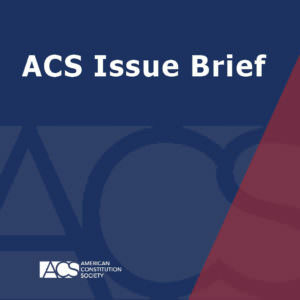 The Issue Brief examines the VRAA’s new coverage formula for preclearance, the expansion of the Section 3 bail-in remedy, the revision to the preliminary injunction standard for voting rights cases, and the provisions mandating public notice of changes to voting laws and procedures. The scholars conclude that these measures are valid exercises of congressional power and that the VRAA appropriately responds to the constitutional standards articulated by the Court in Shelby County and other relevant cases.